This post contains affiliate links. If you purchase something using my link, I receive a small commission at no extra cost to you! I’ll admit, I’ve turned into a huge homebody over the years. Maybe it’s due to the fact that I have kids or I just got tired of “going out”, but I’d much rather be at home with my little family, snuggling up next to the fireplace. Especially during these chilly months; the snow and cold are NOT my friend! I know a ton of people feel the same way which is why I wanted to put together some cozy gift ideas for the homebody. Whether they prefer to Netflix and Chill or host a little pajama party (seriously, who’s coming over? 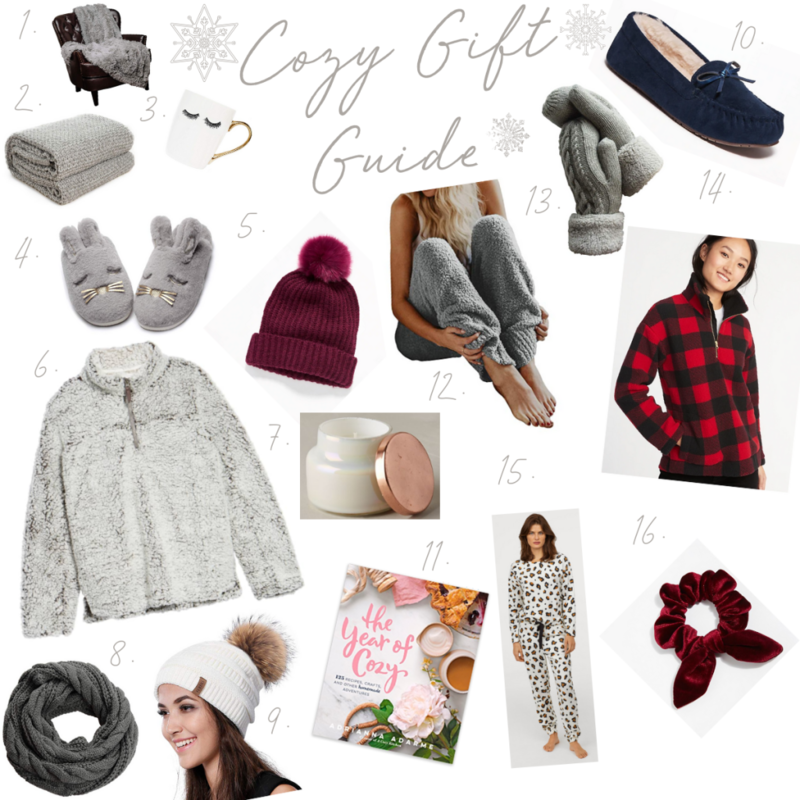 ), I’ve put together some cozy gifts that anyone would love! 1. Faux Fur Blanket. Seriously who doesn’t love anything faux fur? There isn’t anything better than a cozy blanket on a snowy winter day! 2. Knitted Throw Blanket. Another blanket… yes you can’t just have one comfy blanket. This one is for the one who is always chilly! 3. Eyelash White Coffee Mug. Cute mugs are a must for winter! Especially for mommas on snow days when the kids are home from school…give me all the coffee! 4. Slippers. Feet always cold?! I got you… these are so cute and comfy. 5. Burgundy Pom-Pom Beanie. Who doesn’t want an adorable winter hat? 6. Wubby Fleece Pullover. I have gotten so many questions and comments on this jacket so I had to add it to this guide! 7. Mini Capri Volcano Candle. Candles are a staple in my home around this time of the year and this one is a fav of mine. 8. Infinity scarfs are the best for winter! 9. Winter Knit Beanie. My personal favorite winter hat! 10. Moccasin Slippers. For the person who needs serious slippers. 11. The Year of Cozy. The perfect book for cozy reading! 12. Fuzzy Fleece Pajama Pants. I think everyone needs these – how comfy do they look?! 13. Winter Gloves. Cozy comfy gloves another must have. 15. Leopard print pajamas, need I say more!?! 16. And a soft Velvet Scrunchie for Christmas morning! You can shop everything by clicking the links above or the collage below. As always, thank you for supporting this little ole blog of mine! Happy shopping!